Wow !! Leart a new healthy recipe today .. I have tried vegetable idli once, but they didn't puffed up as needed. Hope this recipe works !! Thanks for sharing. Wow ! This is awesome ! Loved this recipe of instant idli and storing the mix is such a handy option . Super combo of flavors in the mix. With the vegetables it is a filling complete meal. Nice one. Must try it. This comes handy in the morning rush hours, those idlis look yummy! Those idlis look delicious and are a perfect solution to the weekday morning chaos! Bookmarking! Even I planned this idly for the theme,but unfortunately I couldn't.This is one such handy mix for a healthy breakfast for rush morning hours.Looks yummy. Those idlies looks just prefect to kick start a morning. Completely healthy and delicious. 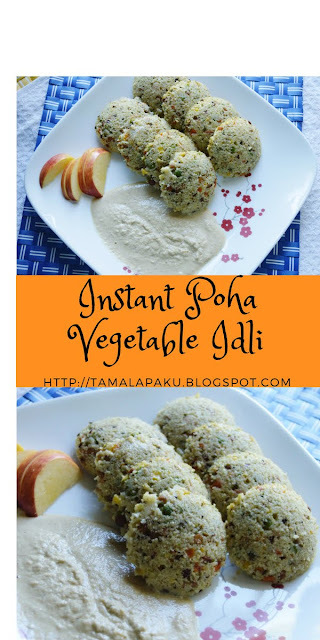 Yummy, these poha idlis that too instant looking absolutely delicious. Really a great idea of using poha. bookmarking will try soon. Thanks for sharing. Great option for when you feel hurry and wanna something healthy.. great snack. I have some millet poha and was thinking on what to do. Your recipe has come at the perfect time. I will try this for the weekend for my daughter. The idlis look amazing Harini. I have never used millet poha and here you are presenting poha idli, wow superb.